There are a lot of useless products for dogs on the market. It won’t surprise anyone who has ever walked into a PETCO. The pet business is a multi-billion business. If you have a Great Dane like our Luna, you probably feel that the billion-dollar business is actually a trillion-dollar business. It is especially true when you have to buy dog food every three weeks, as we do. Beyond the basic nutritional stuff that keeps your dog alive, the pet industry produces no end of products to separate pet owners from their money. Most are crap. Here are my top five picks for the most useless products for dogs. (Feel free to insert your own adjective in lieu of useless). Each would have been better left dormant in the imagination of their inventor(s). (All of the stuff in quotation marks is actual advertising copy designed to convince you that your heretofore sad, sad life with dog will improve after buying what you were previously able to live without). Having owned mixed breeds in the past, part of the joy of owning a mutt is the unknown wonder about the ancestry. This isn’t breeding yearlings for spring thoroughbred sales in Kentucky. Accuracy of ancestry there is worth millions. Not knowing the exact lineage of a mixed breed dog is part of the fun. For those who remain unconvinced and have $65 unallocated to food, shelter or clothing, you can order this “DNA test that recognizes 63 different breeds.” You receive a certificate, which explains “each breed’s dominant characteristics that likely have been passed on to your dog.” Can you say “must have?” (Source: Skymall.com). Large dogs should eat from raised feeding stands as Luna does. But a marble topped-version? If you don’t have enough marble in your home, live in a Trump-branded building, or have purchased at least twice from the Frontgate catalog in the past year, this is for you. It is clearly a seamless fit with your home and your lifestyle. “’This elegant and sophisticated raised dog feeder exemplifies the term “eating in style.’” Who writes product descriptions like this? Seriously, dinner at Downton Abbey is “eating in style.” This is not. I can assure you that dogs can’t distinguish between eating, and eating in style. To them, it is simply eating. (Source: Skymall.com). Got a dog that barks in the house? Want to terrorize it into silence? What’s that you say? Waterboarding your pet unnerves you? Well Mr. Too-Soft-For-The Bush-White-House, just buy this and restore “peace and quiet to a home vexed by a dog’s barking.” This indispensable product is a small 3”H X 5” W X 2.5” D device that “emits a harmless ultrasonic tone, inaudible to humans, that startles the animal into silence.” Sort of like a giant cuff to your kid’s ear when they’ve been bugging you too long with dinner table stories of their track meet success. I’ve gotta admit that I don’t know what happens with long-term exposure to these ultrasonic tones. Don your logic cap for an instant. If they were truly harmless, would they be able to silence your dog so quickly and effectively? Hmmm…don’t think so. (Source: Skymall.com). Sometimes the blogging Gods just throw you one down the middle. How can I miss with this one? It is so good, it immediately begs for inclusion on a best-ever list of the worst pet products invented since The Battle of Yorktown. 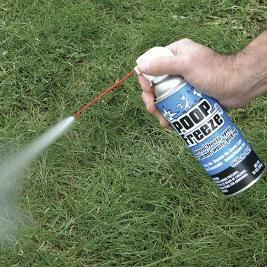 This is basically liquid nitrogen in an aerosol can that you spray on dog poop to freeze it. As the marketing copy proudly states, “Just Frost & Toss with Poop Freeze.” I hope the copywriter got a raise for that one! The manufacturer is so confident you’ll love it, the website clearly states that “all sales are final.” It is a good thing, too, because the Amazon.com reviewers are pretty pissed and would have loved a money-back guarantee. If you want to spend two minutes you’ll never get back, watch the YouTube infomercial. (Source: Poop Freeze website). Is your manly dog is no longer feeling, well, manly due to neutering? Are others laughing at him at the dog park? Is he feeling like sexagenarian action movie stars like Stallone, Schwarzenegger and Lundgren who make disposable films like The Expendables to counter their aging libidos? Then maybe he needs a testicular implant, and you need your head examined. This is what Neuticles are, fake testicles for your dog so his post-neutered “self-esteem doesn’t” plummet. There’s really nothing more to say, is there? (Source: Neuticles website). That’s it. Five pet products that we shouldn’t really be able to live without, but somehow manage to do so. As Public Enemy rapped, “don’t believe the hype.” Trust me, you can continue to live without them.